November – arguably one of the most challenging months of the year. Work is busy, the ground is wet and the days have suddenly become a little shorter. Despite upcoming holidays, this month is traditionally the monochromatic addition to the seasonal colour-wheel. It is a time that produces introspection and increasingly, a time of year where my patients articulate that they have found themselves in a bit of a funk. Pulling yourself out of the November blues is a little like finding the light switch in your grandmother’s dark, clutter-filled basement. Once you find the source of light, the mildew and dampness are replaced with memories and vintage treasures. For each of us the source of light will be different. For some it may mean finding the support to gain more sleep, for others it will mean addressing nutritional deficiencies. Gaining the appropriate assessment and narrowing in on your greatest winter challenges will mean the difference between getting through the winter and soaring through the snow. Take this brief quiz to see where the root of your winter fatigue may be residing. Do you sleep less that 6hours? Do you go to bed before 11pm? Do you wake up with your mind racing? Do you feel better or worse after exercise? Do you have loose bowel movements? Do you eat at least 6 servings of fruits or veggies daily? Do you supplement vitamin D? Do you feel a lack of motivation? Do you feel like you have a decreased capacity to deal with your regular amount of stress? Have you been experiencing more aches & pains? Do you feel sad or blue beginning in late fall? Do you experience feelings of anxiety? Is your sadness or anxiety distinctly seasonal? Do you dread the darker months? Do you have an increase in mood in sunnier climates? 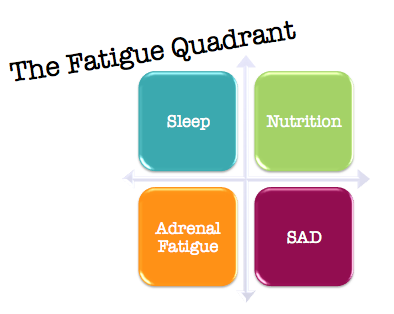 You may have found that one or more of the quadrants apply to how you feel. Addressing nutrition, sleep, adrenal fatigue or S.A.D (Seasonal Affective Disorder) may be easier than you imagined. Stick out your hand and reach for the wall, see, the light switch was closer than you thought.